FRIDAY, Nov. 4, 2016 (HealthDay News) -- The American love of football can extend to children as young as 6, and these pint-sized players aren't immune to injury, a leading pediatricians' group says. 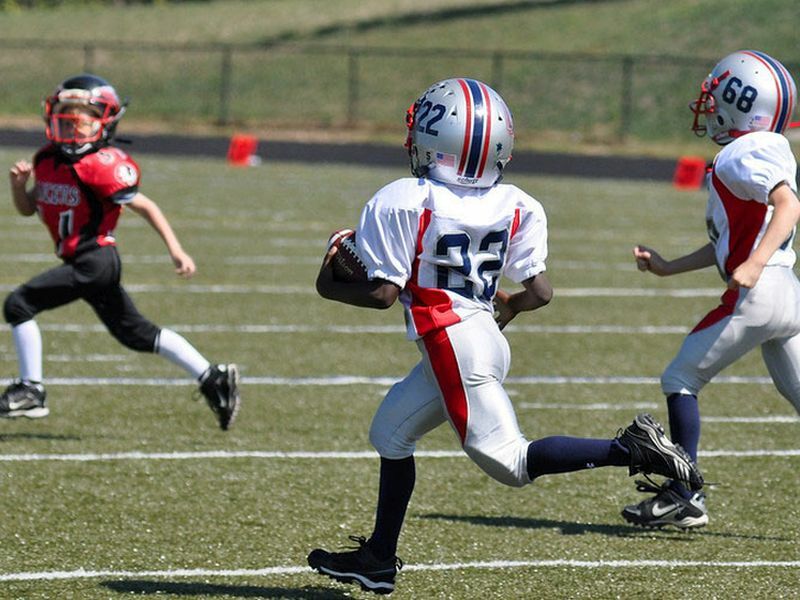 Ankle sprains are one of the most common injuries suffered by youth football players, according to the American Academy of Pediatrics (AAP). Sprains are usually treated with rest, ice, compression and elevation (RICE). But, players who are in severe pain or can't walk should receive immediate medical attention, the group advises. Finger injuries: Fingers can be hurt when they are hit with the ball or another player's hand or body. "Jammed" fingers shouldn't be ignored because an injury to the joint or tendon could lead to permanent deformity or disability if not treated properly. Knee injuries: Knees are often injured when athletes cut, pivot, land from a jump or collide with another player. Those who feel a "pop" or shift in their knee probably have a ligament injury. Athletes who can't walk on their injured leg or feel like their knee will give out should be seen by a doctor right away. Those who try to play on a torn ligament risk more damage to their knee. Shoulder injuries: Football players who dive for a ball, or block or tackle other players are at risk for shoulder dislocations, particularly young athletes. Players usually feel their shoulder pop out of place. In many cases, it may pop back in on its own. Sometimes, a doctor must put the shoulder back into place. Eye injuries: Football players wear helmets but they may be poked in the eye if their opponents' fingers come through the face mask. A doctor should evaluate any injuries that affect players' vision or cause bleeding or swelling inside the eye. Head injuries: If a player's head or neck hits the ground, a piece of equipment or another player, a concussion may result. A concussion is a serious injury to the brain that disrupts normal brain function. This is usually temporary, but the signs of a concussion may be subtle and not show up for hours or even days later. Players with a concussion often don't lose consciousness. Players who've had a concussion are at greater risk of another one. Don't allow athletes to play without supervision. Players should also have access to drinking water. They should be weighed before and after playing to assess how much water they lost during practice. Check shoes and equipment. Athletes should have properly fitted and well-maintained safety gear. Football players should also wear cleats that are appropriate for the type of playing surface they are on. They should wear mouth guards to prevent injuries to the mouth or teeth. Ensure uniforms fit properly. Football pants should fit so that the knee pads cover the knee cap. Hip pads should cover the hip bone, the tailbone pad must cover the tailbone, and thigh pads should cover most of the thigh. These pads should not be removed from the pants during practice or a game. Check the size of shoulder pads. Players should be able to raise and extend their arms without having their shoulder pads rise up into their neck. Shoulder pads should be sized by a player's chest measurement. Ensure helmets fit properly. Football helmets should be fitted so that the eyebrows are about an inch below the front rim. The helmet should cover the back of the head and players' ears should be in the center of the helmet ear openings. The chin strap should be tight enough to prevent the helmet from moving or shifting. All helmets should have a face mask. Have an emergency plan. Players should be advised about what to do in the event of an emergency. A plan should be in place about how to deliver first aid and emergency contact information should be on hand.